– Does CAIR Represent Most American Muslims? There has been much suspicion by many Americans about an organization called the Council on American Islamic Relations (CAIR). CAIR, one of the largest organizations in the US that claims to promote civil advocacy on behalf of American Muslims, would like to represent most or all American Muslims in the United States, just as any other American Muslim advocacy organization would. The above words of course do not necessarily mean Nihad Awad espouses the same view today as he did 20 years ago. Moreover, the posting of the video from Steve Emerson’s Investigative Project on Terrorism website should not be construed as an agreement of all that Emerson projects about Islam and Muslims. Emerson’s credentials, shoddy reporting, and alliances with Islamophobic “experts” are well known. While he has some useful information on his website, he mixes this information with false allegations, such as his portrayal of Muslim moderates like Hamza Yusuf and Zaid Shakir as extremists, and even describing a moderate, non-Muslim author and professor, John Esposito, as an apologist of Islamism. As a result of media attention, CAIR is projected on television screens of millions of viewers. This exposure has resulted in a mistaken image by many that CAIR is the representative of Muslims in the US, just as CAIR would like to be seen. Any allegation, whether true or not, against CAIR for ties to extremism sheds a negative light on millions of Muslims. This causes many to erroneously paint CAIR and the Muslim masses, especially in the US, with the same brush as if their understandings of Islam and politics, as well as their goals, are the same. Muslim and Islam haters use this as fodder to confirm their wrong suspicions that Muslims in the US, through representatives such as CAIR, aim to infiltrate and/or take over the United States. Which Muslim organizations do American Muslims believe represent them? To clear the confusion caused by both the media and CAIR, the answer to this question was fortunately answered in a Gallup Poll conducted from 2008 to 2011. The survey report, “Muslim Americans: Faith, Freedom, and the Future” was released by Gallup in August 2011. Which American Muslim organization most represents your interests? The results are clear that the vast majority of American Muslims do not believe that CAIR represents them. This means that one cannot paint CAIR and other American Muslims with the same brush, no matter what Fox News portrays or who CAIR says it represents. While CAIR has minimal support by American Muslims, other organizations are supported even less. This does not mean that CAIR represents American Muslims. It means that there is a crisis of leadership among Muslims in the United States – if the American Muslim majority even chooses to be represented by any organization. The myth of American Muslims’ support for CAIR, as well as what the media and CAIR wrongly portray, has been laid bare. This is bad news to Muslim organizations that seem to pretend to represent the American Muslim majority when they actually do not, and also for media “pundits” and Islamophobes who do not educate and inform the American public, but contribute to magnifying a distorted and unrealistic understanding of what the majority of American Muslims really think. – Sunnis Against Weapons of Mass Destruction (WMD). Even more unfortunate, the acquisition of WMDs was and is a goal of al-Qa’eda. Militant preachers were quick to recognize and fill in this gap. Al-Zawahiri, known to be a braggadocio and manipulator, may have been overdramatic in this interview to stir fear in the masses. But his desire to acquire such weapons and harm the masses is real. It is to be noted that OBL explicitly advocated the possession of a nuclear weapon as a deterrent. However, one need not have an explicit statement from OBL that advocates usage. OBL clearly believes that killing Muslim and non-Muslim civilians is permissible. OBL and other militants have never specified a limit or threshold of how many innocent Muslims can be killed as “collateral damage” in such attacks, which makes the use of nuclear weapons (and other WMD) – or any other weapon for that matter – perfectly valid from the militant perspective. As long as such weapons are used on “infidels,” that is what matters, no matter how many Muslims are massacred in the process. Because of this surprising gap in knowledge, and perhaps induced by al-Qa’eda’s repeated desire to acquire WMD, extremists capitalized on this by filling in the gap and producing perhaps the first in-depth “fatwa” on WMD in 2003 that “justified” its use from a militant perspective. The notorious pro-WMD fatwa was by the Saudi Wahhabi extremist, Nasir al-Fahd, who was a student of the late Hamoud al-Oqala al-Shu’aybi, who endorsed the September 11th 2001 attacks. Two other extremists of the “Shu’aybi school,” Ali al-Khudair and Ahmed al-Khaldi, also endorsed the pro-WMD fatwa. Though they later recanted, surely by pressure from Saudi authorities, militants nevertheless found the justification they needed for the use of WMD. Fortunately, Egypt’s Mufti, Ali Gomaa, gave a Fatwa against the use of WMD which can be used to counter al-Qa’eda and other militants. Below are excerpts from a Fatwa by Mufti Ali Gomaa against the use of Weapons of Mass Destruction (WMD). Recently, various sects and groups issued several publications asserting the permissibility of using weapons of mass destruction against non-Islamic countries claiming that their allegetions conform to Islamic law. They substantiate their claims with proof from some juristic texts, and on analogy to turs [En. human shield], tabyīt [En. surprising the enemy at night] and tahrīq [En. killing with fire] mentioned in some books of Islamic jurisprudence. In his interpretation of the verse, the luminary, al-Alusi, said: “Anything that can be used as a deterrence in war” [10/24 Dar al-Turath al-Arabi]. In the previous verse Allah commands Muslims to deter their enemies who may be inclined to attack Muslims. Apart from being a principle of Islamic law that factors in punishments and disciplinary actions, deterrence is also a legitimate political principle sanctioned by states in their defense policies and established in military strategies. It is well known that acquiring and possessing WMDs creates strategic and military bal- ance between states and serves to deter any state that is tempted to launch a hostile attack against a Muslim country therefore preventing them from being dragged into an undesired war. This applies to acquiring WMDs and using them to deter enemies and oppressors. There is a difference between acquiring these weapons to deter potential aggressors and between initiating their use. The principle in war is that it should be launched with the authorization of the Muslim ruler; it is imperative that the decision to declare war be based on his own reasoning and his subjects must obey him. A ruler is authorized to declare war due to his knowledge of evident and hidden matters, the consequences of actions and the interest of his people. For this reason, a ruler is authorized to declare wars and hold domestic or international treaties as soon as he assumes office. In turn, he does not issue decisions based on [personal] whims. He declares a war only after consulting specialists in every relevant field such as technical specialists, military personnel, and political consultants who are indispensable in the military strategy. A person or persons who independently determine the use of WMDs not only impose their opinion on their rulers but on the entire [Muslim] community. They give themselves the right to make decisions relating to the destiny of the entire community without recourse to ahl al-hall wal-’aqd [En. those who are qualified to elect or dispose of a ruler on behalf of the Muslim community] in matters that expose the country or people to great dangers. Islamic states must abide by the agreements and treaties that they acknowledged and entered into on their own accord; standing firmly with the international community towards achieving global peace and security [only] to the extent of the commitment of the signatory countries. Abu Hurairra (may Allah be pleased with him) narrated that the Messenger of Allah (peace and blessings be upon him) said: “A believer is not to kill [others]. Faith is a deterrent to killing”. Ibn al-Athir said: “Killing [here] means taking others by surprise and killing them while they are unprepared” [Al-Nihaya fi Gharib al-Hadith wa al-Athar 3/775]. The hadith means that faith is a deterrent to attacking others suddenly while they are unprepared. The Prophet’s words: “A believer is not to attack [others] by surprise” is a clear prohibition since it involves deception. Khubayb al-Ansarī (may Allah be pleased with him) was captured by the polytheists and sold in Mecca to Banī al-Hārith ibn ‘Amir ibn Nawfal ibn abd Manāf. It was Khubayb who killed al-Hārith ibn ‘Amir in the battle of Badr. He remained a prison- er with them for some time. Once, he asked the daughter of al-Harith for a razor to shave and placed her son on his lap. When she came upon this scene and saw Khubayb holding the razor in his hand and her son on his lap, she became scared. Thereupon, Khubayb said to her: “Are you afraid that I might kill him? I will never do that.” She said: “I never saw a captive better than Khubayb.” This is an example of a Muslim imprisoned by his enemies who plotted to kill him. In spite of being on the verge of death, he refrained from killing their son when he had the opportunity to do so. The manners of a Muslim are free from deception and killing others by surprise. Al-Bukhari and Muslim reported through Abdullah ibn Umar (may Allah be pleased with them both) that a woman was found dead in one of the battles fought by the Prophet. There- upon he condemned killing women and children. Another phrasing of the hadith states: “The messenger of Allah forbade killing women and children.” Imam al-Nawawi said: “There is a scholarly consensus on putting this hadith in practice as long as the women and children do not fight [the Muslims]. If they do, the majority of scholars maintain that they should be killed” [Sharh Muslim 12/48]. On that account: We ordained for the children of Israel that if any one kills a person—unless it be for murder or for spreading mischief in the land—it would be as if he killed the whole people, and if anyone saved a life, it would be as if he saved the life of all people [Al-Maeda. Abdullah ibn ‘Amr (may Allah be pleased with them both) narrated that the Prophet said: “The perishing of this world is easier in the sight of Allah than taking a Muslim’s life” [Sunan al-Nassa’i]. Some of these weapons damage individual and public properties, wasting wealth which is forbidden by Islamic law. The prohibition is greater if the wasted wealth belongs to the oppressed. Thus, this prohibition lies in violating Islamic law on the one hand and the rights of others on the other. Permission to enter a country is considered a non-verbal security agreement not to cause corruption in the host country. Imam al-Khurqī said in his Mukhtasr: “Whoever enters enemy lands in safety is not allowed to cheat them of their money.” Commenting on this statement, Ibn Qudāma said that it is prohibited to betray them [non-Muslims in non-Muslim countries] because there is an unspoken covenant to enter in safety on the condition that the person who seeks permission to enter a foreign country does not betray or oppress them. So whoever enters our lands in safety and betrays us violates this security agreement. This is prohibited because it involves treachery which is forbidden in our religion. [Al-Mughni 9/237]. The legal and juristic texts used as evidence to spread this extreme idea are taken out of context. Using these texts in such a manner disturbs peace, ignoring the differences between states of war and peace, and the special rulings pertaining to each of them. This is a compel- ling difference that is inconsistent with using WMDs weapons based on textual evidence on the permissibility of tabīt and ramy al turs. It is a grave mistake to make this analogy even though they are valid in themselves within the context cited by the authors of these texts. It is dangerous to take these rulings from their context and apply them to different situations. Moreover, it is impermissible to derive a ruling permitting the use of WMDs against an op- pressor based on analogy since it is established that there is a difference between the rulings for repelling an aggressor and those of jihad [En. fighting for the cause of Allah]. These in- clude repelling the aggressor by the least violent means. If it is possible to resolve the conflict in a peaceful manner, it is prohibited to use weapons against the aggressor. Using WMDs against others is not consistent with Islamic values. There are great and manifest differences between the two situations. The prophetic traditions mentioned on tahrīq, tabyīn, and the catapult were narrated in a state of war; there is a differ- ence between a state of war and peace. There is a great difference in the effects of throwing stones at the enemy using the catapult and between using WMDs. The effects of the catapult are relatively restricted as compared to the effects of WMDs. The above methods of warfare mentioned in the prophetic traditions were conducted with the approval of rulers. Giving a person, [other than a ruler], the right to declare war is a crime against the [Islamic] community and its rulers under the pretext of jihad. Even if we assume the authenticity of these prophetic traditions, we must note that they refer to specific incidents and cannot be put into general practice. For this reason, some scholars maintained that the principle [in war] is to avoid tabyīt, tahrīq, and destruction; they base their opinion on the general religious texts which discuss the ethics of war. Our opinion is that WMDs that cause fires must not be used due to the prohibition of burning. After ordering his troops to use fire, the prophet forbade its implementation as a weap- on even though the Muslims were in a state of war. Abū Hurayrah narrated that the prophet [pbuh] said: “Allah alone has the right to punish with fire” [Bukhārī]. It is known that many WMDs cause huge fires, therefore it is better to ban their use even in a state of war. It is a mistake to base the issue of the use of WMDs on tabyit because scholars restricted its permissibility by the following: It must be implemented in a state of war. The enemy must be from among those whom Muslims are permitted to fight as compared to the enemy with whom Muslims have a truce. It is impermissible to attack the enemy under the cover of night because it is a violation of the security pact between them in terms of lives, wealth, and hon- or. If it is prohibited to attack under the cover of darkness the enemy with whom Muslims have a security pact, then it is even more prohibited to use such lethal weapons against them. It is impermissible to use human shields save in state of war and under specific conditions detailed by jurists. [Bahr Ra`iq 80\5, Hashiyat ibn ‘Abī Dīn 223\3, Rawdat al Tablibīn 239\10, Mughnī al Muhtāj 223\4, Mughni ibn Qudāma 449\8, 386/10]. – Al-Tatarrus: Al-Qa’eda’s Manipulation of the “Law on Using Human Shields”. Al-Qa’eda and other militants manipulate the issue of human shields in Sunni Islam to justify their killing of masses of civilians. It is well-known that most of al-Qa’eda’s victims have been civilians. Their claim that such “collateral damage” is necessary belies the Sunni tradition they claim to follow. This, in a nutshell, is the approach of militants: manipulating Sunni tradition to justify their terrorist actions. – The Afghan Taliban and Drugs – an (Un)Islamic Partnership. Ahmed Rashid, the well known journalist and author of the book, “Taliban,” among other books, was told the “justification” by the Afghan Taliban of growing opium when they were in charge and running affairs in Afghanistan. “Opium is permissable because it is consumed by kafirs [unbelievers] in the West and not by Muslims or Afghans” (sic). (Taliban, p.118). Seems like international recognition was more important to them than following Islam properly. Neither of the reasons were a proper Islamic justification from any of the Sunni schools of jurisprudence. In this matter, the Taliban were less crooked when they first took over Kandahar. They wanted to eradicate drugs, which was in line with Islam. However, after a few months passed, Shaytan got into their heads and they decided to do a one-hundred-and-eighty and support opium growth instead. Why? Because they realized they needed drugs for easy money and they did not want to upset the farmers who grew it. On top of that, “individual commanders and provincial governors imposed their own taxes to keep their coffers full and their soldiers fed.” Some among the Taliban decided to become drug dealers and even involved their relatives to do haraam deeds. “Some of them became substantial dealers in opium or used their relatives to act as middlemen” (Taliban, p.118). Spreading sin cannot be “Islamic” from an Islamic perspective. 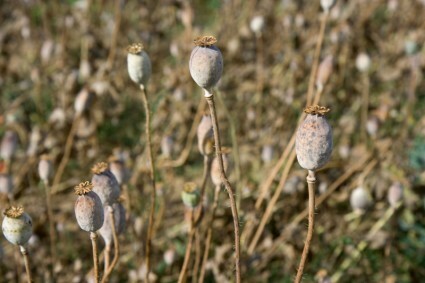 But eradicate the hashish they did, which was probably an attempt to take away a guilty conscience for promoting opium. All along, they pretended opium business was halaal, even though it was not. This sinful indulgence was a violation of the Qur’an and Sunnah. How could the Taliban have expected Allah to be happy with them for breathing, eating, and sleeping with opium? Were they unafraid that living and imposing Islam through sinful means would render their “good” deeds null and void and bring Allah’s Wrath on them? This matter was undoubtedly tugging at them for a while. Seemingly it was too tempting for them to stop opium business so soon. After all, it ran their so-called “Islamic” Emirate. If the Taliban were sincere Muslims, they would have done things differently. They chose material convenience over the religion they deceptively claimed to follow. “Every intoxicant is prohibited” (Sahih al-Bukhari, no. 4088). Opium is an intoxicant. Therefore, it is forbidden. No ifs, ands, or buts. “If a large amount of anything causes intoxication, a small amount of it is prohibited” (Sunan Abu-Dawud, Drinks (Kitab Al-Ashribah), Book 26, Number 3673). Seems the Taliban’s knowledge department lacks knowledge of the above hadeeth. Fourth, the Taliban will be responsible for all sins associated with drug use by their promotion of opium. While the Taliban are currently ousted from power, the drugs they promoted under their leadership – while foolishly believing they were not affecting Muslims – are surely still spreading catastrophe, including among Muslims, in terms of health and other effects. “Then we put them in cold water for many hours, two or three times a day. It’s a very good cure” (Taliban, pg.119). Why sanction torture when Prophet Muhammad said to be merciful? The Taliban is therefore responsible for Muslims and non-Muslims who became addicts when they permitted and promoted the opium business in all of its manifestations. While the Taliban were propping up their “Islamic” Emirate with a foundation of drugs, addicts were on the increase locally, regionally, and globally. From an Islamic standpoint, the Taliban will be held accountable for the burden of sins associated with the spread of opium, for violating the Qur’an and Sunnah, and for deceitfully promoting something haraam in Islam’s name through pseudo-Islamic jurisprudence. “Illicit Drug Trends in Pakistan”. April 2008. Pg.7. “The Paris Pact Illicit Drug Trends Report for Pakistan was prepared by the Paris Pact Coordination and Analysis Unit (CAU) of the UNODC Country Office for Pakistan and benefited from the work and expertise of officials from the UNODC Regional Office for Central Asia” (pg. 3). – What do Muslims Today Really Think? Assumptions of violent interpretations of Islam are different from what Muslims today actually believe and think. While blaming Islam’s scriptures for terrorism, Patrick Sookhdeo and Katharine Gorka — two Islamophobes — cast doubt and suspicion on the intentions of the Muslim majority. “Is that based on researched and documented fact, or on wishful thinking?” (p.5). If most Muslims follow “the violent extremism of Bin Laden,” as the authors insinuate, then why is the overwhelming majority of the 1.6-billion Muslims today behaving non-violently? This question will be answered by well-known polls below that Sookhdeo, Katharine Gorka, and the other authors appear to be unaware of, as the results did not inform their analysis. a) Do most Muslims support the 9/11 attacks? Most Muslims condemn the 9/11 attacks. b) What is least liked by Muslims in their own societies? c) Are the 7% of “politically radicalized” Muslims motivated by religion? d) What do moderate Muslims resent about the West? This means that the recommendations of Sookhdeo and other Islamophobes who blame Islam for terrorism will make matters worse between the US and the Muslim world. This cannot be good for US national security or for America’s relations with the Muslim world. e) Do most Muslims support Shari’ah and theocracy? f) Do Muslims dream of doing combative jihad? b) Do most Muslims think Shari’ah should apply to non-Muslims? c) Do most Muslims support the death penalty for those who leave Islam? d) Do most Muslims oppose democracy and do they stop non-Muslims from freely practicing their religion? e) Do most Muslims support Islamic militant groups? f) Do most Muslims support suicide bombings? g) Do most Muslims think religious leaders should have a large influence in politics? h) Do most Muslims support honor killings and are they driven by religion? i) Do most Muslims oppose interfaith relations? What do American Muslims Think? Contrary to the view of alarmists, American Muslims are not imposing Shari’a law on America and Americans, and there is no active Islamic extremist takeover over of the country or the world. Knowing from the polls above that most Muslims worldwide desire peace and are against the minority fanatical fringe, a “thoroughgoing reform of Islam,” as Patrick Sookhdeo and other Islamophobes recommend, is irrelevant to reducing extremism, including terrorism. As discussed in the results of the polls above, most Muslims residing today who follow classical Sunni Islam are peaceful and do not support terrorism. The Islamophobe’s proposition that Muslims need “reform” aims to resolve a “problem” that does not exist in the larger Sunni community. [[ii]] John L. Esposito, and Dalia Mogahed. Who speaks for Islam What a Billion Muslims Really Think. New York, NY: Gallup Press, 2007. pg.7. [[iv]] Shibley Telhami. The World Through Arab Eyes Arab Public Opinion and the Reshaping of the Middle East. New York: Basic Books, 2013. p.117. [[v]] J. Esposito and D. Mogahed, op. cit., pg.6. [[xxiii]] Robin Wright. (Ed.) The Islamists Are coming: Who They Really Are. Washington, DC: United States Institute of Peace, 2012. p.13. – Syed Qutb: Separating Fact from Fiction. “chief Egyptian ideologue of the radical Islamist movement the Muslim Brotherhood, which seeks our destruction….The entire Islamist world revolves around the thinking of this man […]” (p.153). “You can be sure to find his writings at the foundation of any radical Muslim group today, including al Qaeda” (p.154). Sebastian Gorka, another author in the book, and Islamophobe par excellence, says that Qutb’s “only way” of cleansing society from alleged jahiliyya “is through jihad, through holy war” (p.198), and then quotes Qutb as saying, “Islam is not a religion, it is a revolutionary party” (p.198). However, Gorka seems unaware of the fact that there is debate on whether Qutb was calling for revolutionary violence or not. Extending linkages from Syed Qutb to the “entire Islamist world” is an exaggeration that has been addressed by scholars John Calvert, Fawaz Gerges, and William Shephard. Reilly, it seems, follows the same strange logic in his explanation of Islamic history when he somehow links his understanding of the classical Sunni Ash’ari school of creed with the rise of Osama bin Laden. “the ‘terrorism’ and the ‘martyrdom operations,’ which are seen as the particular trademarks of al-Qaeda and, to some extent, Hamas, have the least grounding in Qutb’s writings. We can say, however, that his dichotomous ‘Manichaeism’ and his theological absolutism do provide fertile ground for the seeds of ‘terrorism’ and ‘martyrdom operations,” even if they are initially alien to him. Any ideologue who feels certain about ultimate truth and perceives a clear and absolute distinction between right and wrong, good and evil, is capable of justifying even the most horrendous of actions. History illustrates this all too well. This far, but no further in my view, can we call Qutb an ideological father of Islamist violence[[vii]] ” (italics added by reviewer). Reilly’s and Sebastian Gorka’s understanding of Qutb and links to al-Qa’eda lack the sophistication and scholarship needed for a more informed and realistic understanding. [[i]] John Calvert. Sayyid Qutb and the Origins of Radical Islamism. New York: Columbia University Press, 2010. p.7. [[iii]] F. Gerges, op. cit.,pp.31-32. [[vii]] Zaid Shakir, “Sayyid Qutb and Modern Islamist Violence,” Seasons Journal 4:1 (Autumn 2007): 36.